For my last meal in Portland, we headed to The Country Cat in the southeast. I really wanted to go to this food truck called Kim Jong Grillin’ because, honestly, I couldn’t think of a food truck with a better name. But alas, it was closed that night. 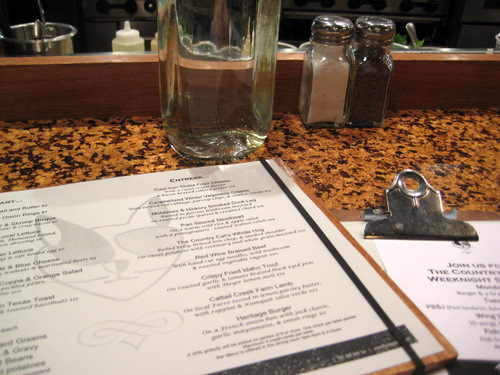 The Country Cat is a neighborhood restaurant specializing in Farm-to-Table food, where everything in prepared in-house. It’s got a good sized dining and a bar. There’s also a chef’s table at the open kitchen, which is where we dined. It got really hot there! 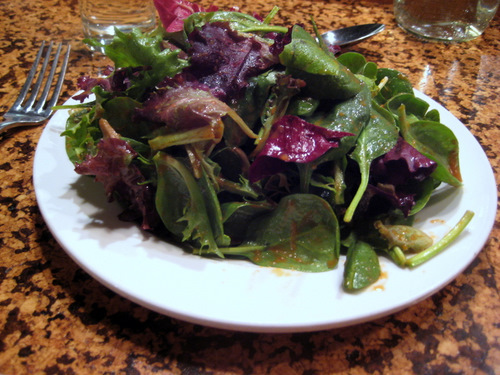 The mixed salad of local greens with a really zesty house dressing. This was a big plate of greens, just greens. Would it have killed you to throw in a tomato? A piece of carrot? It was just too… green for me. And the dressing, while good, was a bit too much. They need to lighten up on the amount of dressing. The greens were nice and fresh. 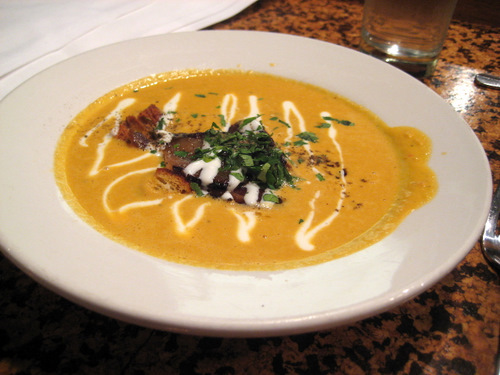 The soup of the day, which was some kind of sweet potato or butternut squash type of creamy concoction (sorry I forget! ), topped with a whole lotta bacon, croutons, and fresh cream. I love creamy and thick soup like this. When it’s cold out, there’s really nothing I love more. And this was a nice sizable bowl! Plus, bacon! Any soup with bacon is a winner in my book. Here’s the cast iron skillet fried chicken with bacon braised collard greens, served with a honey drizzled sweet cream biscuit. It’s delicious! It’s extra delicious because I got to watch them make everything. I think they cook this chicken twice in the skillet. It’s hot and juicy. I’m not the biggest fan of greens, but I definitely liked these, as they weren’t bitter at all. 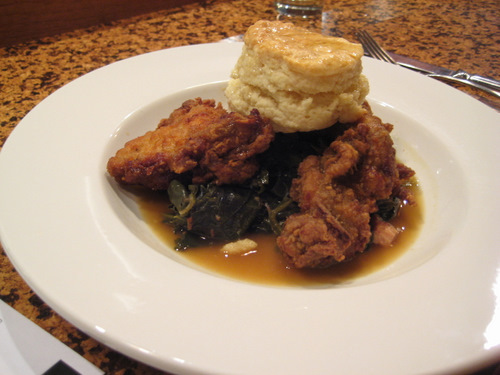 And I absolutely love biscuits, especially when they pour gobs of honey over it… I can see why this dish is so popular. Service was good and I enjoyed the free show!